Turns out officials at the Guggenheim Museum doesn't only offer amazing art: they make pretty great jokes, too. On Thursday, it was revealed by the Washington Post that US President Donald Trump and First Lady Melania Trump requested a Van Gogh painting from the Guggenheim Museum for the White House. 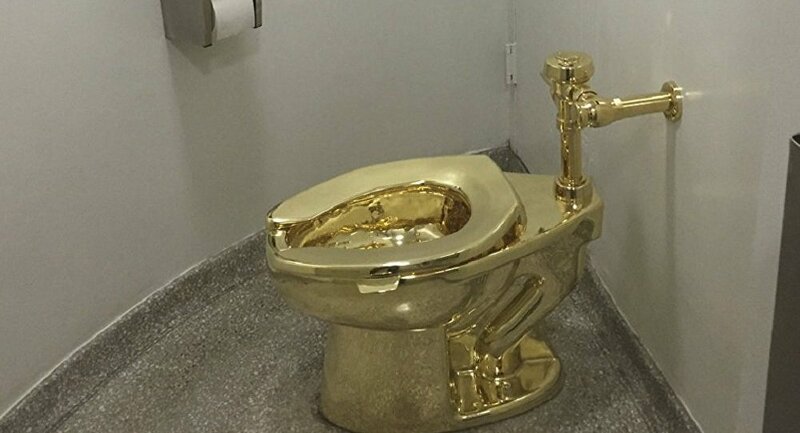 Rather than obliging the couple, however, curators instead offered the Trumps its 18K gold toilet, dubbed "America." In a September 15 email obtained by the Post, curator Nancy Spector wrote that the toilet, which had already wrapped up its exhibition, was available, "should the President and First Lady have any interest in installing it in the White House." "We are sorry not to be able to accommodate your original request, but remain hopeful that this special offer may be of interest," Spector said in the shady email. "[The artist] would like to offer it to the White House for a long-term loan. It is, of course, extremely valuable and somewhat fragile, but we would provide all the instructions for its installation and care." The golden throne, the work of Italian artist Maurizio Cattelan, was open to museumgoers for use during its run in the Guggenheim bathroom starting in 2016 and is estimated to have cost $1 million, the Kansas City Star reported. The Trumps initially inquired about obtaining Van Gogh's "Landscape with Snow" painting. The Guggenheim described the toilet as offering "a wink to the excesses of the art market but also evokes the American dream of opportunity for all — its utility ultimately reminding us of the inescapable physical realities of our shared humanity." Though it's unclear if the White House will be accepting the toilet, netizens are enjoying the roast nonetheless. ​When the Post reached out to Cattelan on why he wanted to offer the work to the Trumps, he explained that it was a "very delicate subject." "What's the point of our life?" he asked. "Everything seems absurd until we die and then it makes sense."